Did you know that you are an Artist Heroine? 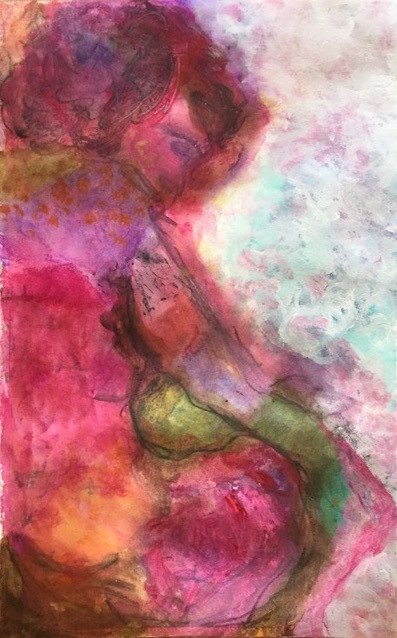 An Artist Heroine is someone who develops her own life story by consciously creating her life, striving to continuously evolve into her True Self, and who uses the gifts – her Super Powers! – she was given at birth to make the world brighter. This is how you live Unstuck JOY! We will look at ways to strengthen your Super Powers so you can live the Artist Heroine life of your dreams! Also, watch as Vicki creates an Art Vision journal page LIVE during the show! Click below to watch this episode of Unstuck JOY! Here is the Art Vision journal page I created during the show of my Artist Heroine! We all have lives that are made up of different events and choices we make. These create our Personal Landscape. It’s up to us to cultivate that landscape into the life we desire. Part of designing our Personal Landscape is to define our Super Powers that we were given at birth to make an impact on the world. Not sure what your Super Powers are? Ask your Inner 8 Year Old and your Future Elder Warrioress! 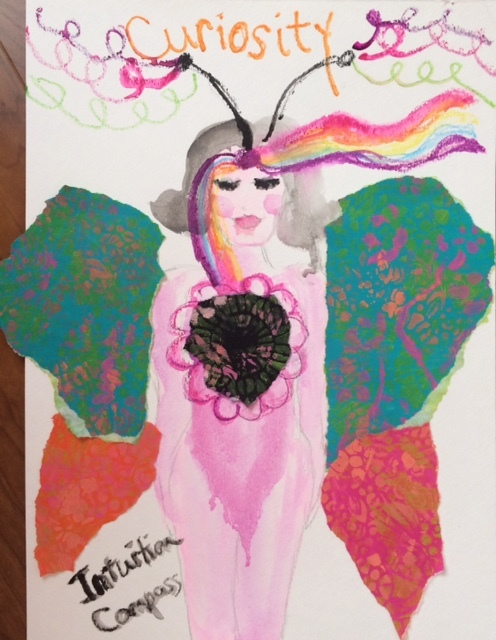 ART VISION JOURNAL PROMPT OF THE DAY: Create your artist heroine! 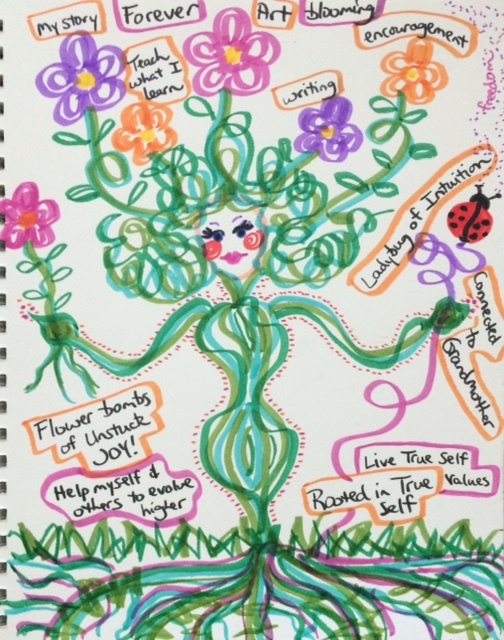 Here is my Artist Heroine with her Super Powers of Intuition Ladybug and Flower Bombs of Unstuck JOY that take the form of my art, teaching what I learn, my story of two life flips, writing, and encouraging others! What is an Artist Heroine? 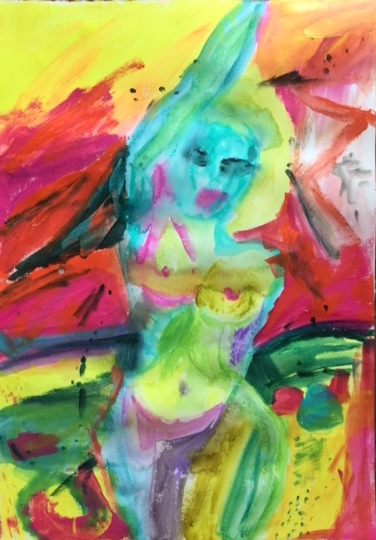 Someone who acts as the Artist Heroine of her own life story by consciously creating her life, striving to continuously evolve into her True Self, and who uses the gifts – her Super Powers! – she was given at birth to make the world brighter. This is how she lives Unstuck JOY! I am an Artist Heroine. I listen deeply to the guidance of Source Energy and intuitively co-create my ultimate life vision with Source Energy – the same Energy that aligns the starry galaxies and causes jellyfish to emit their translucent light into the ocean depths. I was born with beautiful gifts – my Super Powers – that are unique to me. My life Purpose is to use these gifts to make the world a brighter place. If I conceal my Super Powers, I am doing the World a grave injustice because no one else can bring forth my unique Light. I strive to remain in an emotional state of Unstuck JOY, love and gratitude to manifest into my True Self and create the life I desire. I tend my emotional garden each day by courageously pruning limiting beliefs, circumstances and relationships that block me from blooming into my best Self. I acknowledge that my birthright is Unstuck JOY, abundance, creativity, and prosperity. I am the powerful artist-creator of my unique life vision. The power of “I am…” These words form your experience and give instructions to your subconscious mind, so it creates that experience. What does your Artist Heroine look like? Is she an animal, angel, mythic creature, cartoon character, a spirit, voice, person, element of nature, etc.? What Super Powers/Gifts does your Artist Heroine possess? How does she use these Super Powers? What are the impacts of her Super Powers on herself (you!) and the world? What limiting beliefs do you need to shed to fully be your Artist Heroine? What do you need to allow to fully be your Artist Heroine? How do your life and experiences change when you act from your Artist Heroine self – your True Self? Draw your Artist Heroine and her Super Powers! If your Inner Critic pops up, tell her to quietly sit in the corner. Repeat after me: I AM a powerful creator! There are NO mistakes in Art Vision journaling! Contemplate the Art Visioning prompt of Create YOUR Artist Heroine. 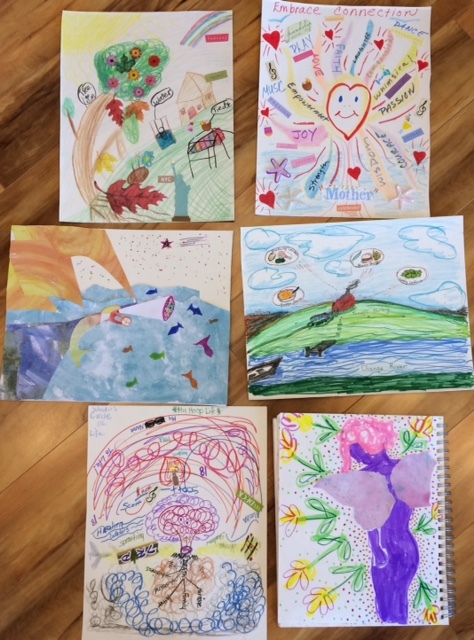 CHECK OUT WHAT PARTICIPANTS IN MY ART VISIONING WORKSHOP CREATED TO express their Artist Heroines & super powers! Let Your Wild Woman Spirit Howl!